Folk Flute by Casey Burns, Key of D, $450. Nothing Less than Great Sound. The Torn Jacket, played by Grey Larsen on my earlier 2 piece version of the Folk Flute. Recording courtesy of Grey Larsen. whistle players getting a "first flute"
Is the Folk Flute is an appropriate choice for me? YES! Beginning traditional flute players want an easy to play and maintain instrument that they can grow with. The Folk Flute fits these requirements well. Intermediate players want an instrument that has a good tone and quick response that will hold up well in sessions. My more expensive flutes (many without all the acoutrements such as tuning slides and keys) are widely used in sessions. The Folk Flute is acoustically identical - and thus works well for sessions. The player is not limited by this instrument. Why buy a Folk Flute when less expensive plastic flutes are available? One primary advantage of wood over plastic is that the voice keeps getting more and more amazing as the instrument ages and is played in, like any decent wooden instrument. This simply never happens with a plastic flute. The wood adds something complex and lovely to the sound that is lacking in some plastic instruments. Wooden flutes are easy to care for, similar to other common woodwinds such as recorders and clarinets. Plastic flutes may be a good choice for some in extremely dry climates, or situations where humidity extremes will put the instrument at risk. However, I have sold many of my flutes to players in dry climates, who take them hiking and even mountain climbing and these do just fine. Taking care of such an instrument doesn't require that you be a rocket scientist and is easy as caring for a guitar or a violin. By request, I seal the wood with a polyurethane sealer which renders it impervious to humidity changes. I am considering keys or a tuning slide later on. Should I get one of the other models? The Folk Flute is a good reference point even for those unsure about these extra options. Many of my Folk Flute clients decide eventually that they want a flute with all the bells and whistles from me or one of my contemporaries. Once in hand, some have reported keeping their Folk Flute as a handy traveling instrument, or a comfortable and familiar fallback when they just can't cope with the new keywork. Is the Folk Flute tuneable? 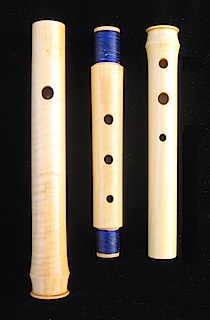 I make the Folk Flute with a 32-33mm long headjoint tenon, which allows for some adjustment for when tuning to other players. The headjoint can be pulled out or rolled inward to flatten it as needed. Since most everyone plays at A-440Hz only a small range of tuning adjustment is needed. The range is similar to that found on wooden recorders. I have small hands. Will the Folk Flute work for me? YES! YES! YES!!!! I started addressing the needs of smaller handed players as far back as 1985, and iteratively developed flutes that are comfortable to one's hands with the narrowest finger spacings available in the Irish Flute market. Distances between fingerholes (measured center to center) range from 32 to 35mm on my Standard flute, and from 29 to 32mm on my Small Handed Flutes. Holes are usually offset for further comfort. Fingerhole Spacings for my flutes - measured center of hole to center of hole, for comparison purposes. My Standard Flute has a slightly closer fingerhole spacing than most of of the other flutes out there, if only by a few millimeters in some cases. However, these few millimeters and the offset can make a huge difference. And for small hands, nothing else exists that can compare with mine for comfort. If your hands are on the small side, and especially if you have issues with such things as arthritis or tendonitis, or simply want a flute that doesn't require you to spread your fingers much, select one of my flutes. The spacing of the Large Holed Standard is very close to the Standard. On the upper hand holes the spacing is 35mm and 34mm. On the lower hand the spacing is 33mm and 33mm. The holes are a little larger (.5mm to 1.5mm) due to their lower position on the flute body. This should be considered if one has very narrow fingers. Are the smaller handed flutes quieter? Not at all. Most of the sound generation is due to the shape and effectiveness of the embouchure hole. Any effect of the resulting smaller fingerholes may be easily overcome by increasing the degree of undercutting, bore profile and other acoustical aspects. 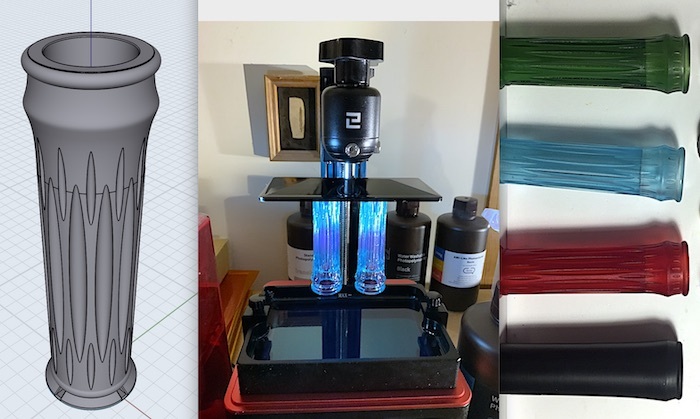 The best way to accomplish this design-wise is to make several hundred of these flutes - while trying to make each one better than the previous one. I have done this and my smaller handed flutes hold up very well in sessions and performances. Ergonomic versus In-line Fingerholes explained: Most Irish flutes by other makers, antique flutes and many other wind instruments have finger holes that are all straight in-line. I have found that a slight bit of offset for the 2nd and 3rd holes for each hand helps tremendously by making the flute more comfortable to play. I call this arrangement "Ergonomic". With respect to the 1st fingerhole, the 2nd hole is rotated about 1mm or less away from the hand bringing the ring finger closer to the 3rd hole, which is offset 1-2mm towards the hand. The 5th and 6th fingerholes are increasingly offset by 1 and 2mm or more towards the hand with respect to the 4th hole. Essentially the fingerholes are arranged in slight arcs which correspond to the usual arrangement of fingertips. This option is the commonly selected one for Folk Flutes and my more expensive flutes. If you are a fingertip player, especially with small hands this is the best choice. However, some traditional players use the lower pads of the finger joints ("piping style"). For these players in-line is the usual arrangement. Can these be made left handed? Yes. Simply email me when you order that you would like your flute set up for left handed playing. What doesn't come with the Folk Flute: end cap, rings, tuning slide, keys and retrofit capabilities, specific customizeability. Leaving out these options allows me to quickly make these flutes available with quick delivery times - for a price most can afford. A simple cloth case is provided. What wood should I choose? I use African Blackwood and Turkish Boxwood for my flutes. None of these species are rainforest species, and all come from responsible sources. Blackwood has been used for clarinets for years and is the the wood most flute makers use. Blackwood grows in savannas from Tanzania to South Africa. Wild Boxwood from the forests of Turkey has been used for flutes for centuries. All of these woods hold up very well in most climates and all make excellent flutes. I used to make these in Mopane but the wood is very difficult to obtain dry and ready to use. I have a small quantity that I reserve for my more expensive flutes. Boxwood versus Blackwood: The differences in tone between the woods is actually quite minor. Blackwood is the flute wood wost widely used, and gives a flute with a nice strong tone. Boxwood is warmer sounding to the player, but perhaps quieter by a few percent. All woods hold up well in dry climates as long as the care instructions are followed. If you are unclear about which wood to pick, choose Blackwood. You cannot go wrong with this wood. Blackwood and CITES African Blackwood and all Rosewoods were recently classified under CITES (The Convention of International Trade of Endangered Species of Flora and Fauna ) to protect these species from illegal harvesting and transport. Under the rules, you are allowed to travel with your flute as a personal item across international boundaries without any need for CITES permits or documentation. If you are ordering a flute from outside the United States, however, I am required to include with the export documentation a copy of my permits issued by the US Department of Agriculture and the US Fish and Wildlife Service. All of the Blackwood that I use is pre-Convention, documented, and permitted under Master Permit 20521C, issued by the USFWS. You may also be required to obtain an Import Permit under CITES. This is the case for Ireland and most of the European Union countries. Australia, New Zealand, Canada nor Japan require you to get an import permit - the CITES documentation that I send with the flute is sufficient. Let me know if I can help you figure out where to obtain the necessary CITES import permits. What is the difference between the Folk Flute and the more expensive $700 Standard Models? Acoustically these are exactly the same flute, made from the same woodpile and the same reamers, and tuned and voiced the exact same way. Tuning and voicing so many Folk Flutes means that these and my more expensive flutes will all play and sound great. In 2012 I produced 167 flutes out of which 140 were Folk Flutes. This gives me lots of practice with tuning and voicing compared to some other flute makers who may only tune and voice a few flutes each month. Tuning and especially voicing (this is what determines how well the flute plays and how it feels to the player), like anything musical, requires constant practice and application to remain being really good at it. I prefer it if these flutes play as well or better than the more expensive flutes of my competitors! The Folk Flute is my lower cost "loss leader" and is a good way to get my flutes in the hands of many players, who then come back for the more expensive models. The difference between these and my more expensive models is what is offered and not offered. On the Folk Flute the flute is set up without any customization to the clients hands aside from small or regular hands. Tuning slides, bands, end cap and keys are not offered for this model. For my $700 flutes, I offer a few more choices of acoustical models. Usually a single piece middle joint is usually used. Customization to fit your hands specifically, tweaking after you have played it some if necessary and all the bells and whistles (tuning slides, bands, keys) may be added either when you order or retrofitted to the flute later on (at $400 for the slides and bands, and $450 per key). All of my flute models including the Folk Flute play excellently. If you want your flute "tweaked" and custom fitted to your hands etc., order one of my more expensive flute models. The Folk Flute is designed to be an acceptable model within the range and preferences of most players, and to play really well. At this point I have shipped over 1000 of these since 2003 and the feedback has been overwhelmingly favorable. 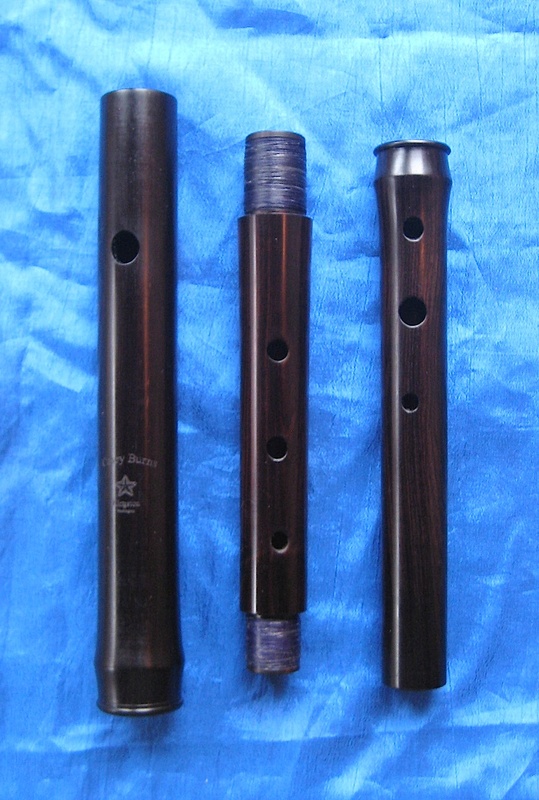 Folk Flute versus Other Inexpensive Flutes: I notice that people on discussion lists commonly ask questions about this or that inexpensive flute. Frequent answers suggest this or that flute made from PVC, Bamboo, and other materials one can find at a typical hardware store. These flutes do work for some. But in the majority of cases, these flutes will have a cylindrical bore, widely spaced holes, and are frankly disappointing. I recommend getting the real thing. The Folk Flute is the real thing! You will getting a true wooden flute with a proper tapered bore, undercut toneholes, etc. You are also getting an instrument made with the skill and experience of someone who has been mastering this art form for over 30 years. Your instrument is probably worth more and I could probably charge more, since these play as well as the many expensive flutes made by my peers (and these also play as well as my expensive flutes). I simply like to provide a lower cost but very high quality instrument in excellent wood to as many players in the world as possible. Its what I do. In terms of access, my smaller handed flutes especially serve a need for small-handed players. I have been working on perfecting a smaller handed flute model since 1986. Only a few other makers seem to have any grasp of this concept and all are way behind me in terms of experience and practice. Caring for the Folk Flute: Your flute will be easy to care for. You will simply need to protect it from extreme dryness, oil it with bore oil occasionally, and adjust the fit of the tenons as needed by adding or unwrapping thread. Detailed care instructions are provided with the instrument, and can also be downloaded here. Embouchure cuts: I occasionally get asked if I provide different styles of embouchure cuts, similar in concept to what is available for modern flutes and Irish flutes by other makers. The short answer is "No". The embouchure is integral to the bore, tone hole lattice and other acoustically important factors. The ovoid embouchure that I use is actually quite complex in its shape and design, and varies from flute to flute as the flutes themselves vary flute to flute. I allow a little bit of variation into the process as this allows my flutes to constantly evolve as I pursue what works best, when I am in the tuning and voicing process. The end result is a flute that plays well, has a terrific tone, and is very forgiving to every player. Testimonials: I should really post some of these on a separate page sometime when I get the chance. I get so many of them! The ones that really get to me and remind me why I keep doing this are from players who have had to stop flute playing entirely - because their antique flutes (or flutes made based on the original flutes) kept making their hands sore. They report the joy they now feel now that they they can enjoy playing the flute and make this a regular part of their lives again! I get several of these every year. Domestic (US) Shipping: $17. I ship via USPS Priority Mail, insured at full value through Endicia. Canadian Shipping: $48. Please read the note above concerning African Blackwood and CITES! I insure and document your shipment at full value. Any duty or sales tax (VAT/TVA) is your responsibility. Consult your local authorities. Delays in Customs processing are not my responsibility. If an invoice is needed for accelerating such processing let me know or simply use the email acknowledgement generated automatically by PayPal. United Kingdom Shipping: Please use the International shipping rate button. International Shipping (except Canada): $60. Please read the note above concerning African Blackwood and CITES! I insure and document your shipment at full value. Any duty or sales tax (VAT/TVA) is your responsibility. Consult your local authorities. Delays in Customs processing are not my responsibility. If an invoice is needed for accelerating such processing let me know or simply use the email acknowledgement generated automatically by PayPal. Your flute will be shipped by International Priority Mail. Shipping status as of 10 Feb 2019: Usually orders take up to 60-90 days before shipment. All the pending orders before today's date (Feb 27) are almost done and I hope to ship most within the next week or two. Flutes ordered in March and April will ship in May to June, depending upon how fast I recover from an upcoming knee operation. If you need one for summer workshops Now is the time to order. International Blackwood Folk Flute Orders: Note that those ordering Blackwood flutes from Europe must now obtain a CITES import permit from their country's wildlife authorities. These are not required for Australia, New Zealand, Japan, Chile or Canada. These are not difficult to get but must be in hand and a copy emailed to me before the flute can be shipped to you. Please let me know if I can help you chase these down! In some instances, the authorities won't grant your permit until the instrument is ready to be shipped, and is inspected here and the exporting permits signed and stamped. Many are getting around this by ordering their flutes in Boxwood instead, which is not under any CITES restrictions. Buy the Folk Flute together with Grey Larsen's Essential Guide: For convenience, you may order a Folk Flute together with Grey Larsen's book, The Essential Guide to Irish Flute and Tin Whistle. Domestic (US) Shipping: $20. I ship via USPS Priority Mail, Flat Rate, insured at full value. Canadian Shipping: $55. Please read the note above concerning African Blackwood and CITES! I ship via USPS International Priority Mail, and insure and document your shipment at full value. Any duty or sales tax (VAT/TVA) is your responsibility - consult your local authorities. International Shipping (except Canada): $76. Please read the note above concerning African Blackwood and CITES! I ship via USPS International Priority Mail, and insure and document your shipment at full value. Any duty or sales tax (VAT/TVA) is your responsibility - consult your local authorities. Canadian customers: Please use the Canada Customer "Buy Now" buttons above for your purchase. If you have questions or problems completing your order, please e-mail me. Also, please email me your phone number so that I can include it with the required postal documentation. All transactions are in US Dollars. International customers (except Canada): Please use the International Customer "Buy Now" buttons above for your purchase. If you have questions or problems completing your international order, please e-mail me. Also, please email me your phone number so that I can include it with the required postal documentation. All transactions are in US Dollars. If you do not wish to purchase with PayPal or Credit Card: Please e-mail me with your purchase request to arrange payment details. For US Customers I accept personal checks and money orders; For International Orders, I accept only secured payment methods in US Dollars. Orders will ship after funds are verified. All sales are final. Customization, servicing, tweaking and repairs if any will be considered on a case by case basis. You will receive an automatically generated acknowledgement of your order. Please refer to this website for delivery updates, which are updated weekly, instead of contacting me. This allows me to concentrate on the flutes, not answering email. By ordering, you agree to these terms.